Spring is in the air! This week marked some significant milestones for the year’s long-awaited ships. Don’t worry if you were busy with your holiday weekend plans. 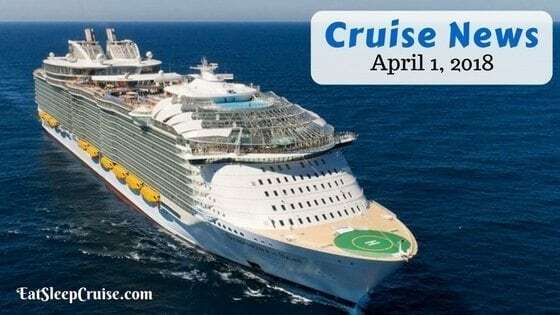 We have all the details in this edition of Cruise News April 1, 2018. The largest cruise ship in the world is now officially in the hands of Royal Caribbean International. The cruise line took delivery of Symphony of the Seas a few days ago. This new world record holder offers many of the favorite features found on other ships in the Oasis-class. Along with the Bionic Bar, the Ultimate Abyss, and the Perfect Storm waterslides, this ship also features some new additions. These new venues include the Playmakers Bar and Grill on the Boardwalk and the Hooked Seafood restaurant. Escape From Planet Z laser tag is also a first for the cruise line. The ship will be offering European cruises through the spring and summer and will transition to the U.S. this fall to sail from Miami, FL. Looking forward to 2020, Regent Seven Seas released details of its latest luxury cruise ship. When the new Seven Seas Splendor hits the ocean waves, the ship will be one of the most elegant afloat. Learning from the design of its predecessor Regent Seven Seas Explorer, the line is making small design adjustments to this anticipated new ship. These changes include the addition of outdoor dining space at the coffee shop, the repositioning of the central staircase, and a few other minor tweaks. Seven Seas Splendor will be home to 375 suites, including the Regent Suite, which boasts a 1,100-foot balcony overlooking the bow of the vessel. If you are looking to booking a sailing on this new ship, reservations open up April 11th. After spending a month in drydock, Carnival Paradise is back. The multi-million dollar refresh for the ship included the addition of a Guy’s Burger Joint, and the BlueIguana Cantina and RedFrog Rum Bar. While on land, the ship received 38 new cabins, as well as the addition of 98 balconies to existing rooms. The children’s program was also updated, and the sun deck received new waterpark features including a slide. The ship offers five and four-night Western Caribbean itineraries stopping at ports including Cozumel, Mexico. Yes, another new mega-ship has found its way home. Just a few days ago, Carnival Cruise Line took the helm of the latest Vista-class ship. In a ceremony at the Fincantieri shipyard, the Carnival Horizon officially became part of the cruise line’s fleet. Officers and company officials were on hand for this transfer of ownership. The second ship in its class, Carnival Horizon is Carnival Cruise Line’s largest ship to date. Carnival Horizon showcases features like an IMAX theater and the self-propelled SkyRide, a suspend bicycle ride above the pool deck. The ship sets sail on its 13-day maiden voyage from Spain on Monday. In May, the ship will head to New York City where it will be christened in a star-studded evening event featuring the ship’s godmother, musical artist and actress Queen Latifah. This summer, Princess Cruises will be adding more fun to its Caribbean sailings. The company will be launching the new experience, Rhythm of the Caribbean, this May on Caribbean Princess. As part of an initiative to give cruisers a more “immersive cultural experience,” the new offering will include entertainment such as local musical performances and themed deck parties. Dining room menus will see the addition of fresh entrees and other items influenced by local culinary traditions, as well as the addition of Caribbean inspired cocktails. Other activities and talks inspired by the history and lore of the Caribbean will also be part of this onboard enrichment. The Rhythm of the Caribbean will be expanding to other Princess ships sailing in the region in the fall of this year. 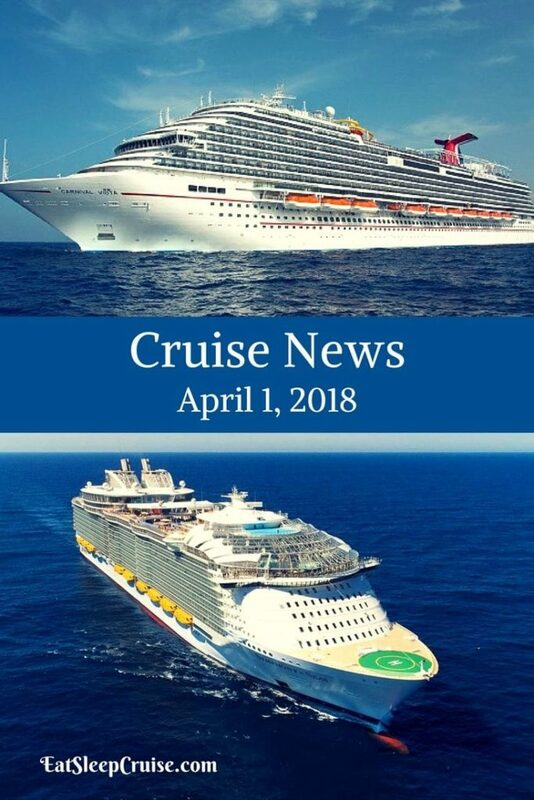 Did we miss any major updates in this edition of Cruise News April 1, 2018? Do you have any headlines that you want to share? Drop us an anchor below with your latest cruise and travel updates.